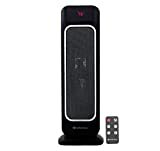 Bovado - Oscillating Ceramic Forced Fan: Space Heater • The Air Geeks, reviews of air conditioners, dehumidifiers and air purifiers. Bovado’s Oscillating heater is a fan-forced heater meant for mid-sized rooms to supplement your heating systems without taking a bite from your paycheck. During the cold seasons, solutions are needed to ensure that room-filling ambient warmth is achieved faster in quiet and safe conditions. We are going to review the main features that this space heater has to provide and determine if it is a worthy investment for you. Without wasting time, let’s jump straight into the features. As a rule of thumb, the number one feature we should inquire about for any appliance, let alone space heaters, is the safety feature. Portable space heaters do possess potential fire hazards and care must be taken to ensure there are enough features to help you manage the risks. Almost half of all heating fires in the U.S can be blamed on space heaters. This appliance is ETL certified. This is a thumbs up from independent testing laboratories that confirm whether a heater passes a battery of safety checks. In addition, it features an overheat-protection cut-off switch that cuts power in case there is an anomaly that could cause overheating or motor destruction. The third safety feature is the topple or tip-over detection switch that automatically shuts off the device to avoid fires in case the device falls on flammable materials. The ceramic build also aids in ensuring the device does not emit too much heat which can cause burns in the event the user touches the exterior cover or the grill. If you are especially looking for oscillatory features, this one has a maximum of 70 degrees of oscillating space to ensure the heat is distributed evenly across the room. However, there are a lot of competitors offering as much as 360 degrees of oscillation, so this one lags in comparison – the larger the oscillating capacity of a heater, the easier it is to distribute heat across the room. This heater has a tower-type design that has a maximum height of 23 inches and 7 inches in width. This tall and slim build enables the heater to do its job without using too much real estate. It can be used in tight spaces such as corridors or between furniture without a problem. The design is compact and appealing, especially to tower-lovers. Availability of different colors would have made things better especially for those who don’t like black-colored appliances. There is a control panel at the front top and an additional remote controller for convenience. The control panel features a digital LED display that provides information on the status of the appliance. A thermostat is included to help you manage different types of heat settings. There is also a timer that has a maximum of 8 hours of timed operations after which the device automatically shuts off. You can also set the appliance to an ECO-mode that adjusts the heat settings automatically for maximum savings. It does a good job in maintaining the noise to a quiet whisper. Even on the high setting, the device does not become a disturbance although the lower fan setting would be the ideal in case you want to sleep or work. This heater is portable and the handle ensures a good grip if you want to relocate the device to a different room. No caster wheels on this one, yet. Fits on tight spaces: The slim build ensures the appliance does not use too much space. Display could be improved: The design of the display could be improved to enhance user experience. These heaters are a fantastic investment for anyone !!! I hesitated to purchase my 2 but am SO HAPPY with them !! They are so easy to learn to control with the remote or on the heater itself and they run very quiet all you can hear is a slight fan sound (quiet)a and they oscillate very quietly and run smoothly without any problems and I am actually considering purchasing one more for my home :)"
It is a nice heater. I like the option to choose the economy feature. The remote control is also a great feature. It shuts off if knocked over. My only complaint is that it would be nicer if a little weight an added to the base. It feels flimsy, but it works well." Bovado USA’s Oscillating Heater is a good heater to supplement your heating system according to our analysis. It has the majority of the features that are accepted as standard. A number of things here and there can be perfected though but we are giving a thumbs up since it is a relatively new entry in the market as compared to its competitors. Some of the weight could be shifted a little bit lower to make it less flimsy. The ECO-mode is a great feature and users will appreciate the handy remote although the display panel itself leaves a lot to be desired.